Picking the best from the available sun hats for men on the market can feel like finding a needle in a haystack. Luckily, your search ends at Shape Flexer. We sell all-purpose and all-weather sun hats for men that suit a wide range of styles and preferences. Whether you are playing tennis in your yard or going on a hiking adventure, you can expect our sun hats for men to provide unparalleled comfort and protection. Our sun hats for men are highly wind-resistant. 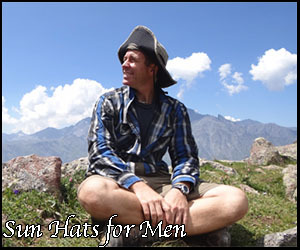 If you are often faced with strong winds during your travels, why not purchase one of our Shape Flexer sun hats for men? Our sun protective hats for men are designed to withstand winds that gust up to 65 mph (105 kph). This means that even if it is super windy where you are at, you can rely on the sturdy brim of our sun hats for men not to fold or flop. Our sun hats for men are easily foldable. Ultimate portability sets our sun hats for men apart from the competition. These sun hats for men can easily be folded and fit into the smallest of spaces. When you are carrying a compact travel pack, you can store the Shape Flexer sun hat with ease. The brim of our sun hats for men is bendable. Unlike other similar products on the market, our sun hats for men has a brim that is supported by a patented, durable wire. This material is bendable, which makes it possible to adjust the shape of the brim of our sun hats for men to your liking. Our sun hats for men have a back cape. Another feature that makes our sun hats for men different is their deployable, hidden neck cape. You can use this cape of our sun hats for men to provide cover for your nape whenever needed. When you don't, you can also easily be tuck the back cape of these sun hats for men in its pocket. Our sun hats for men have a zip-off crown. Guys with long hair can avoid the "sweaty hat and hair" look by zipping off the crown part of our sun protective hats for men. Zipping off the crown of our sun hats for men can be a great option for when you prefer wearing an open hat not only for ventilation but also for style. Our sun hats for men provide secret storage. You do not find sun hats for men with secret storage every day, but that is what you get when you purchase the Shape Flexer hat. The hidden cape pocket of our sun hats for men can serve as an on-the-go shelf for your valuables, including cards, money, maps, and receipts. Our sun hats for men are machine washable. We understand that travelers and adventurers often have hectic schedules. Also, we know that the garments and accessories of these people accumulate more dust and dirt than normal. That is why we designed our sun hats for men to be machine washable. With this feature, you do not need to wash any of our sun hats for men by hand. You could simply have a laundry machine do the cleaning for you. Do you need a high-quality and durable sun hat to beat the heat? Browse through our offerings today, and purchase the right Shape Flexer hat for your adventures. Our sun protective hats for men come in various colors and styles. Contact us for more information about the specifications of our hats. Read more about selecting a sun hat here: http://bookmanssports.com/five-considerations-selecting-sun-hat/. Sun hats are more than just an addition to your outfit. They protect you against harsh UV rays, which is why these products are important for your health.